Disclaimer: As an invited guest of Disney Social Media Moms Celebration I was able to attend private screenings, had access to several behind-the-magic moments and received free products and gifts from sponsors. I paid all travel fees for myself and my guest, and am not being compensated for reviews. As always, all reviews are honest and all opinions expressed are my own. The first day of the Disney Social Media Moms Celebration, Land & Sea included a Family Welcome Dinner which was held at Disney's Animal Kingdom. Sponsored by GoGo squeeZ, the mystic Pandora-themed dinner, drinks and entertainment were follwed by a private preview of Disney's newest nighttime spectacular - Rivers of Light. As we left the dinner area and walked towards the new 5,000 seat Discovery River Amphitheater, we were treated to the iconic Mickey's Premium Ice Cream Bar. My mom was having a wonderful evening, her first ever at Disney's Animal Kingdom. True story: we also both enjoyed our first Mickey Ice Cream bars that night! When we entered the the theater were were tempted to sit down right away, but quickly realized the amphitheater is SO spacious that we could walk all the way down to the front row. TIP: The best seats are in the center of Discovery River Amphitheater. The amphitheater is divided into two "villages" separated by a bridge and the river, and Rivers of Light is staged in the center of Discovery River. For the best view of the water screens and floats I recommend sitting in the center or, if the center isn't available, towards the right side of the amphitheater (away from DinoLand). There's also a standing room only section at back of Discovery River Amphitheater. Our seats were perfect and from the moment the show began we were captivated. The 15-minute nighttime spectacular features live performers, 11 floats, water screens, fountains, a beautiful music score and over 50,000 programmable, color-changing LED lights. Please enjoy the video preview below. If you have seen my tattoos, you know I love lotus flowers. The lotus, which grows in mud and emerges from the dirty water clean and beautiful, is seen as a symbol of purity and rebirth in many cultures. 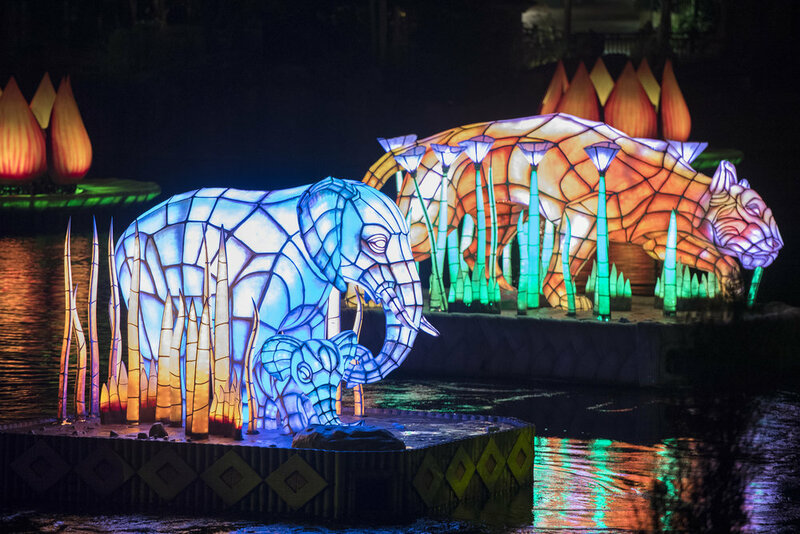 Rivers of Light does a wonderful job of celebrating humanity, nature, life and the connection between humans and animals. My favorite water screen graphic - the lotus. The show begins with two Storytellers who come to the river bearing "gifts of light". Through lights, music and stunning technology, they use water and light to summon animals onto the water screens. Disney's Animal Kingdom park is the perfect setting for this life celebrating show. The show is focused on animals and nature and once it was over we felt comforted by a sense of harmony and love. The mesmerizing show, with the Tree of Life as its backdrop, is not to be missed. I promise you - you will love it! TIP: Watch the animals on the water screens closely. The footage comes from Disneynature films, and some of the footage has never been seen before. Use the My Disney Experience mobile app or view the park schedule for showtimes. This show runs on select nights for approximately 15 minutes. Use FastPass+ to secure your show time. Rivers of Light Dining Packages are available at Tiffins and Tusker House Restaurant. Each package includes: A meal, 1 non-alcoholic beverage and Premium seating for Rivers of Light show. All dining package information can be here. 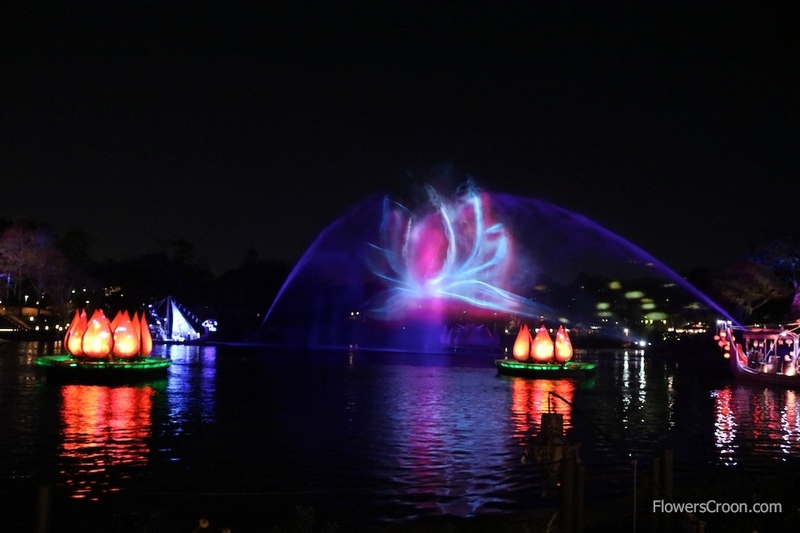 Rivers of Light premieres today, February 17th and we think you will love this magical show! It's a welcome addition to the other nighttime experiences available at Disney's Animal Kingdom such as Tree of Life Awakenings, Discovery Island Carnivale and more! When is your next visit to Disney's Animal Kingdom? Are you excited about the new nighttime entertainment? Let me know what you think of Rivers of Light when you experience it for yourself.